In October last year I was invited to stay at Port Lympne with Wyse London. At dinner that evening I sat next to a lovely lady (who had THE most incredible skin) and we ended up chatting about all things health. At the time I was still cutting out sugar because of my Candida overgrowth and she told me she that she had been drinking celery juice every day for 6 months. She had suffered with the Epstein Bar Virus for months on end and had done a lot of research into ways to get her health back. She told me her secret to getting back on track (and her incredible glowing complexion) was drinking celery juice every morning. At first I thought, yuck, I’m not sure I could stomach that first thing, but I was willing to try anything to feel better, so I bought a load of celery and got started. I can honestly say that I haven’t stopped since that day. Bearing in mind that I am a fad vitamin pill taker, the fact that I am still drinking celery juice every morning, 4 months later is a small miracle! So why do I drink it? I don’t know about you, but if something is a bit of faff to make, I am unlikely to stick to it and lose interest quickly. 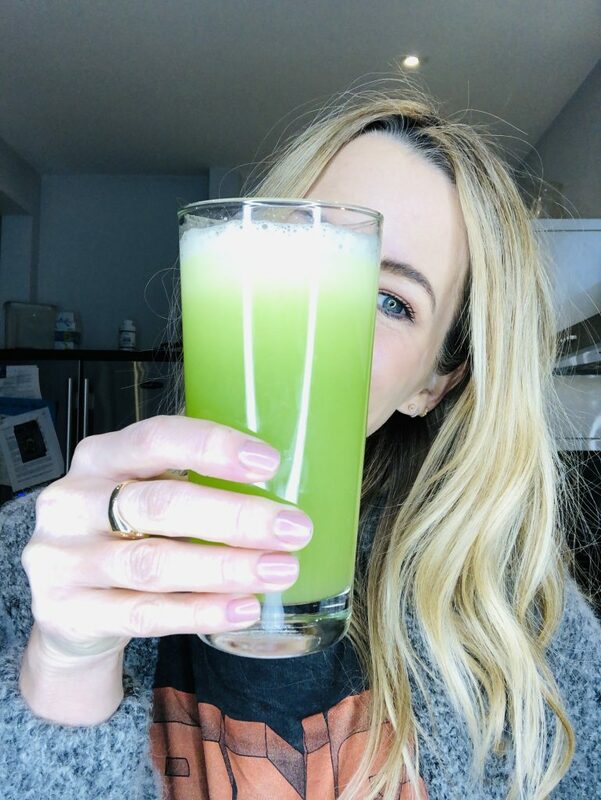 Weekday mornings are enough of a rush… So I have figured out a way to make sure my celery juice is quick and easy to make. 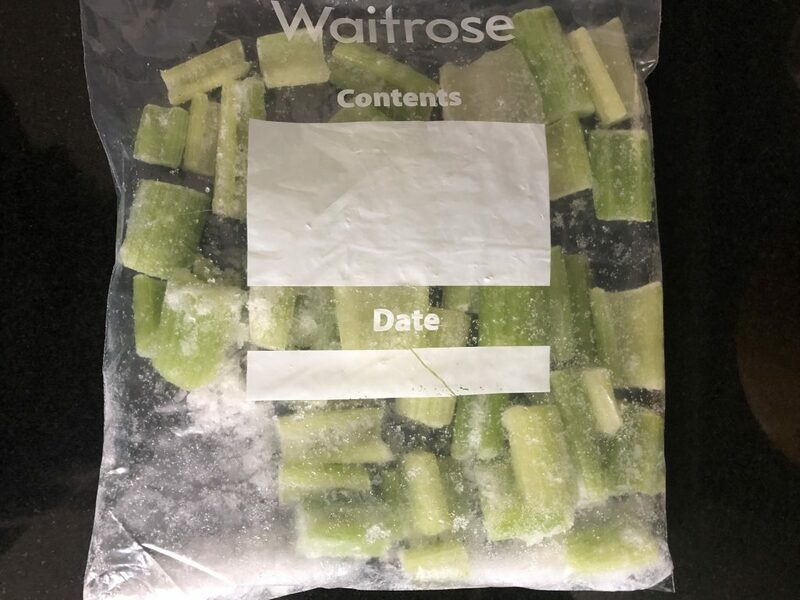 I do try to have fresh celery in the fridge, but that is not always possible when life gets busy and there isn’t time to dash to the shops to get emergency celery supplies. So I buy in bulk, chop and freeze. Every night before bed, I take my portion of celery out of the freezer and it’s ready to pop in the nutribullet in the morning. 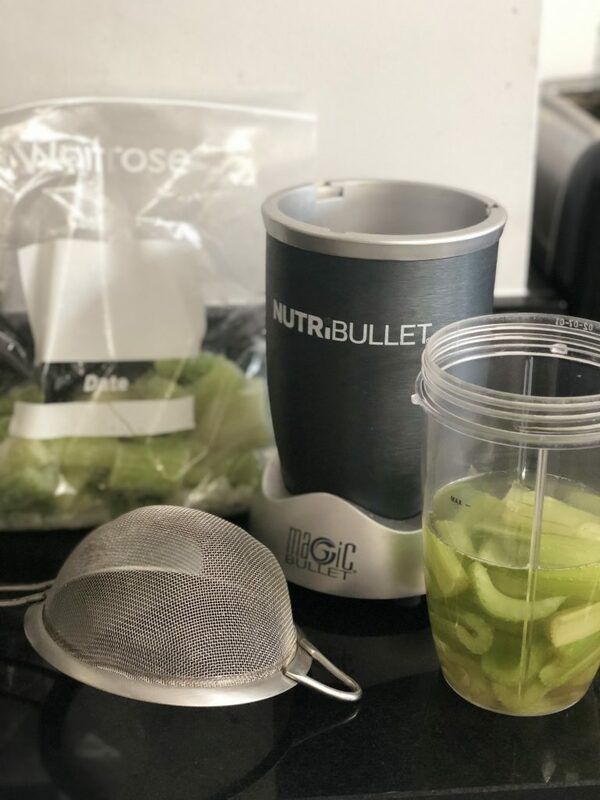 We don’t have a juicer and I have always felt that they were too fiddly compared to my neat and simple Nutribullet. So I pop the celery in with water, whizz up in the Nutribullet and then put it through a sieve to get rid of the pulp. You don’t have to do this, but I find it feels too filling if I don’t. Lots of people use a nut milk bag for this, but I love the way I can bang the sieve on the bin and all the pulp comes out in one go, leaving the sieve really easy to clean and rinse. From the research that I did, I read many articles that said it is important to drink celery juice first thing on an empty stomach, but I don’t think there is any scientific evidence to prove this. I just feel as though it aids my digestion for the rest of the day if I drink it first thing. I have to admit that I had to hold my nose at first as I didn’t like the taste, but I soon got used to it and now I actually find it quite pleasant. I thought that I would link to a few conflicting pieces on the benefits of drinking celery juice. That way you can make your own mind up, but for me, seeing is believing and I really have seen a difference. CNN – Are the celery juice health benefits real? Celery juice benefits: Does it help with weight loss or inflammation? Going to try this as my skin is not great at the moment . How much celery do u use for each juice . It sounds wonderful and as you say, having kept it up is a testament in itself. Do you know if the celery has to be juiced or would just eating 2 sticks be the same? Some of the articles from medical professionals say that there should be no difference. My mum doesn’t like the celery juice, but likes celery so she eats sticks instead! I am pretty sure its good for you if not better because of all that fibre? The magical guy most people on this side of the Atlantic have not yet heard of ..is @medicalmedium. Celery juice is his offering to the world along with his books of wisdom on how to make simple basic changes to our diet for greatly improved wellbeing. Nothing short of miraculous. Would love if you would share with everyone. Anthony Williams is one of a kind magically changing lives! Just wondering if anyone who’s tried this loathes celery generally? I do, I can taste even a tiny amount in a salad, it tastes disgusting to me – I can eat it if cooked in a casserole, but somehow I suspect boiled celery juice won’t cut the mustard. So really I would like to know if it tastes similar to sticks of celery, or if miraculously it changes flavour in the juicing process? Love the sound of ginger mixed in, while I loathe celery with a passion, I love ginger to bits! I juice it with one green apple and half lemon as can’t stand the taste on its own. I can tell you it’s definitely works for me. I couldn’t get out of bed for over a year due to a bad virus and now after drinking this for 5 months I finally have energy, clearer skin and better digestion. I’m currently suffering from Candida overgrowth and would love to hear how you treated yours and if it worked? There are so many different types of advice out there from killing it vai tables to really harsh detox for months on end to just cutting out sugar. What worked for you?